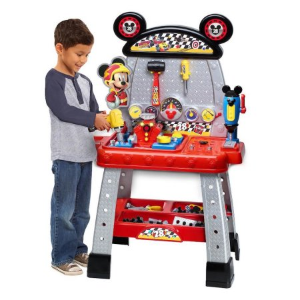 Walmart offers the Disney Junior Mickey and the Roadster Racers Pit Crew Workbench for $29.99. Product Features: The Mickey and the Roadster Racers Pit Crew Work Bench has everything kids need to help Mickey Mouse and his crew get ready for the races! The workbench stands 40 tall and comes with over 40 play tools and accessories including an electronic play impact wrench, drill press, mallet, screwdriver, open-end wrench, screws, nails, and play metal pieces! The bench also comes with a removable light and play engine that features Mickey phrases and realistic sound effects.